Macedonian Kings. Philip III, 323 to 317 BC. Silver Drachm. Philip III, the feeble-minded half brother of Alexander the Great, was a puppet king put on the throne by Alexanders Generals so they could maintain control behind the scenes during the first few years after Alexander's death. Mint : Lampsacus. Date : 323 to 317 BC. Size : 18.1 x 19.0 mm. Weight : 4.20 grams. 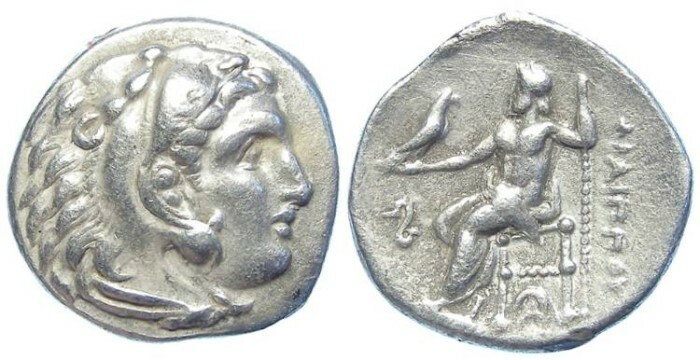 Reverse : Zeus seated left, holding a sceptre and eagle, with FILIPPOU to the right, a buckle below Zeus' hand, and a crescent over an A below the throne.